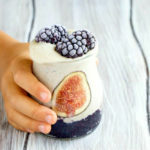 I have the BEST smoothie for you today! 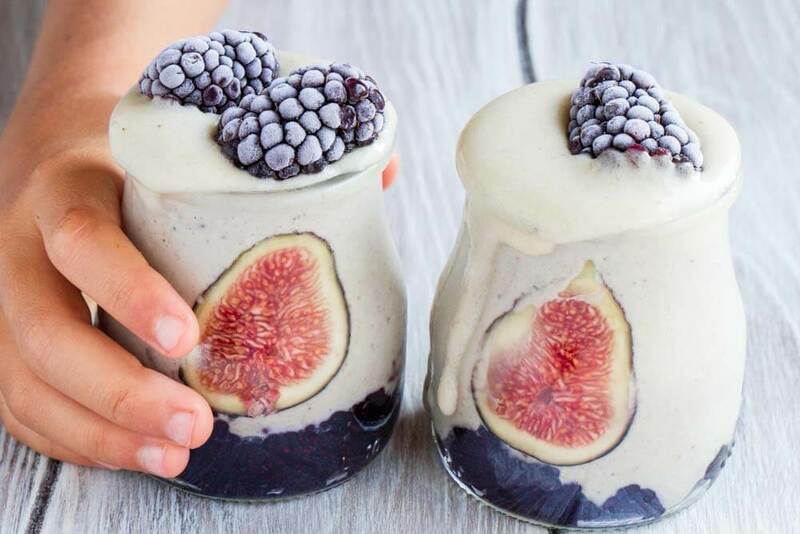 A super rich and creamy smoothie made with cashews and figs and finished off with a touch of cardamom. Any fig lovers out there? This smoothie is made for you. And now that we are moving into Autumn, figs are EVERYWHERE. I’ve been seeing them in salads, flatbreads, and desserts of all sorts all over Pinterest. Have you tried them in a smoothie? 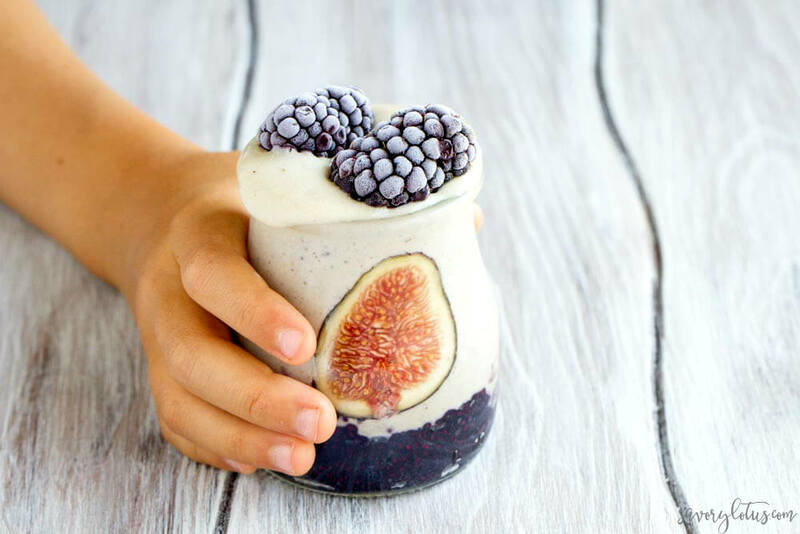 Today I’m sharing with you a creamy smoothie that’s loaded with protein and nutrients but feels like a decadent treat when you eat it. There are 2 versions of this smoothie: one with banana and one without. I have been experimenting with substitutes for the super sweet bananas in my smoothies and have been using steamed and frozen cauliflower instead. I know, it sounds a bit weird, but it’s actually a thing. Cauliflower gives a really nice, thick, smooth texture to my smoothies. And I’m getting more veggies into my diet. That’s always a good thing, right? All you have to do is lightly steam your cauliflower florets and freeze them until ready to use. I add about a half cup per smoothie. I’ve also been doing the same with sliced zucchini, which is surprisingly good in smoothies as well. Who knew it was so easy to thicken smoothies without banana? I’m a big fan of thick creamy smoothies. I’ve never really liked super sweet, fruity ones. 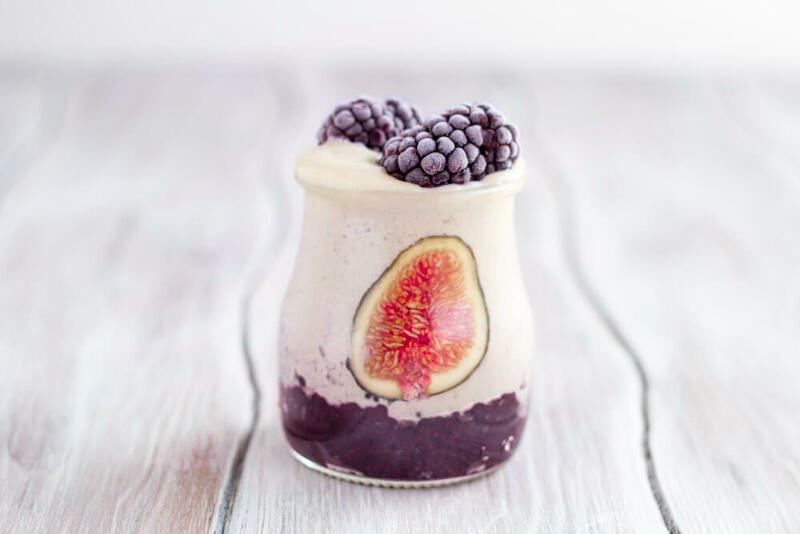 The base of this smoothie is made with soaked cashews which give a super creamy texture. The combo of figs and cardamom give it a nice fall time feel. And it’s your choice whether you do the traditional banana version OR try out my cauliflower version. Both are fabulous. This smoothie is not only delicious, but it keeps me full and fueled for hours. It’s has about 13 grams of protein (from cashews and hemp seeds) and is packed with tons of essential vitamins and minerals. The recipe makes either two small smoothies or one large one. The berry chia jam I put at the bottom is totally optional. We’ve been really into parfaits and layered smoothies around here. I like to get creative with my food. Place all smoothie ingredients (except for sweetener) in blender and process until creamy smooth. Start with 1/8 teaspoon of cardamom. Taste and adjust for cardamom and add extra sweetener if desired. 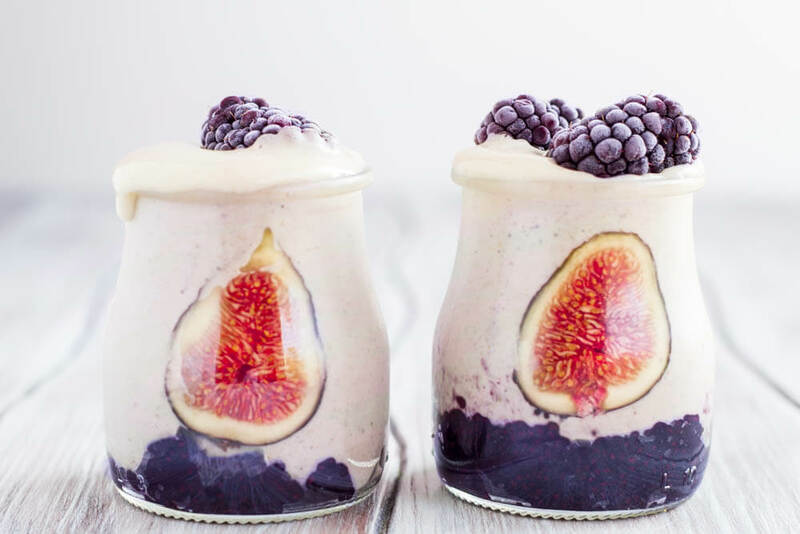 Gently place thinly sliced fig onto inside of a dry glass, layer optional jam at bottom of glass and pour smoothie on top. Garnish with frozen berries. Enjoy! ** to prepare cauliflower for use in smoothies, steam florets until just barely fork tender. Cool and place in freezer until ready to use. *** if using banana, you probably won’t need additional sweetener. I tend to add 1 tsp of raw honey if using steamed/frozen cauliflower. **** to get fig to stick to glass, thinly slice fig and gently place slice on inside of VERY dry glass. Pour smoothie slowly in.